In this lesson we are going to learn to use an LCD display. This really allows us to take our Arduino projects to that next level! We will first get the LCD hooked up and show we can display a simple welcome message. Then we will use it to display the distance measurement being made from the ultrasonic sensor. So, do not take your project apart from LESSON 18. 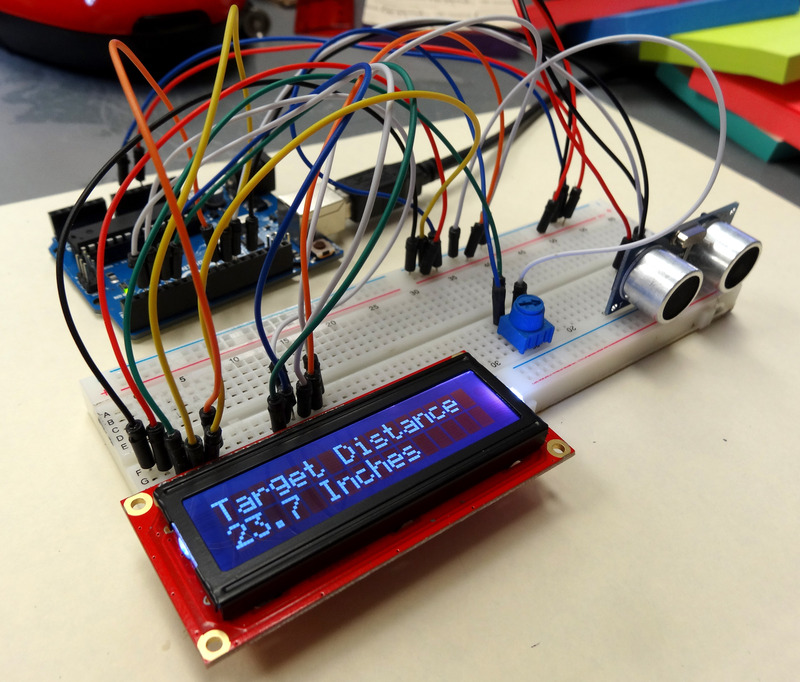 This circuit displays the distance you measure on a cool LCD. 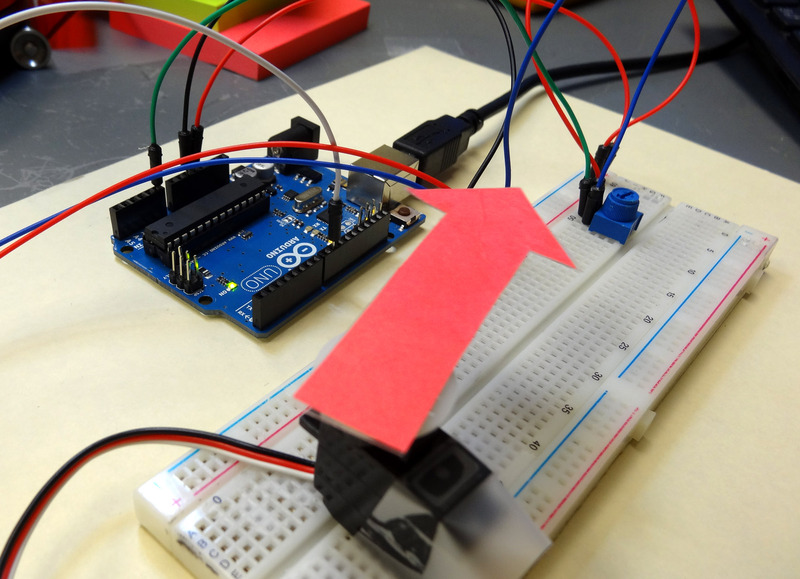 This table shows you how to connect your Sparkfun Inventor Kit LCD to your arduino. (If you do not have the kit, and want an LCD like the one in this tutorial you can order it HERE.) When oriented like the photograph above, pin one is the pin in the upper left corner, and they are numbered sequentially from left to right. 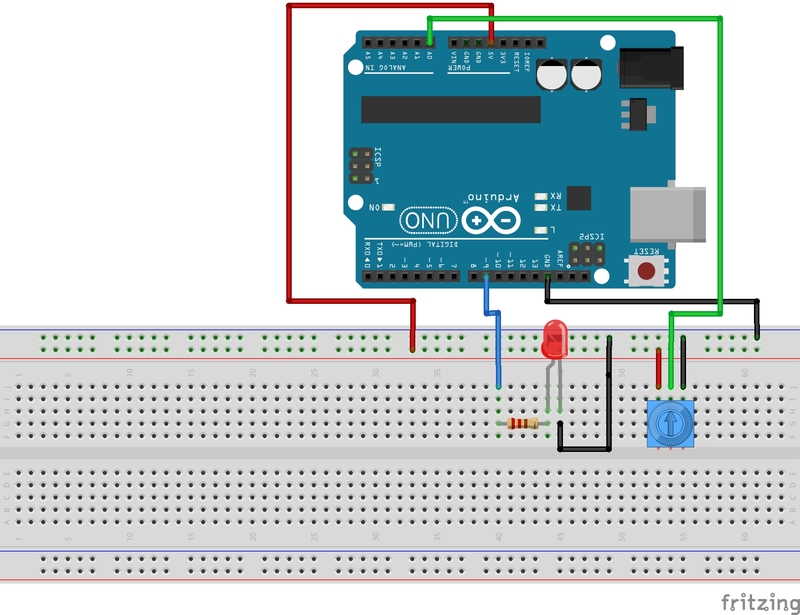 The table below shows the connections needed to allow the arduino to work with this LCD using the code we will write in this lesson. The pinout of other LCD might be different, but if you connect the LCD named pins in column 2 to the Arduino pins in column 3 in the table below, you should be able to get many of the 16X2 LCD’s to work. 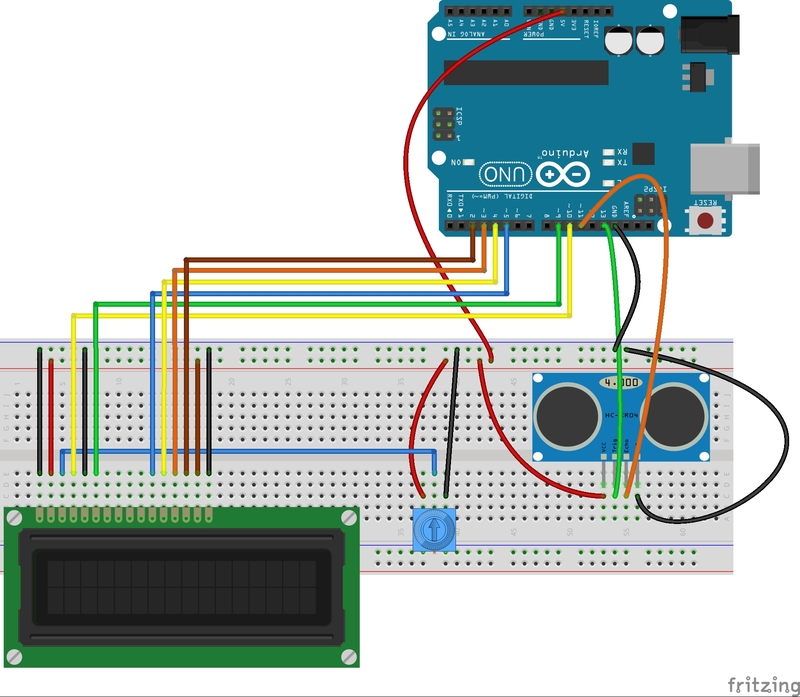 For this project, you can use the table above to connect your LCD to the Arduino. The diagram below is a graphical representation of the connections for LCD like mine. 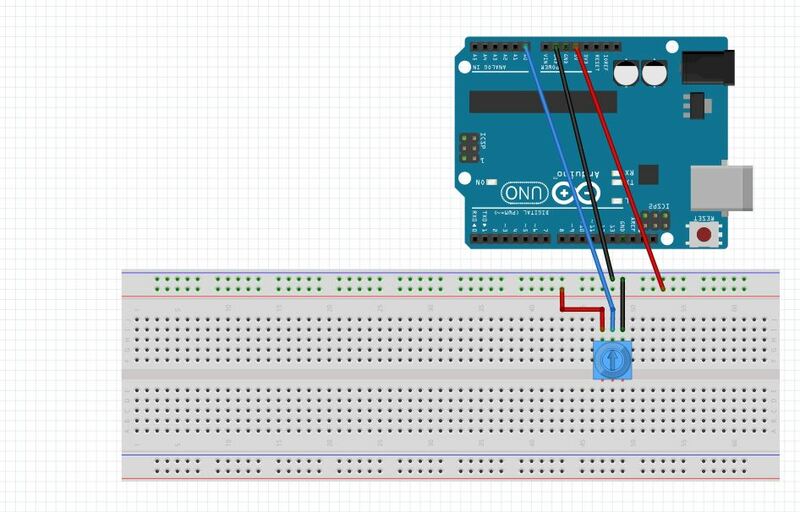 This diagram shows how to connect my LCD to the Arduino. These LCD are tricky to hook up because there are so many wires. You have to be very careful, and you have to make sure your LCD is oriented properly. Check the spec sheet that comes with you LCD carefully to verify connections are correct. Once the LCD is wired up, it is fairly straightforward to use. The numbers tell Arduino that we have RS hooked to pin 10, E hooked to pin 9, DB4-DB7 connected to Arduino pins 5-2, as shown in the table above. Now we would go to the second row and print a counter. Lets bring all the code together in the following working program. Run this program. If you have your LCD hooked up correctly, you should see the counter working. If it is not showing, you probably have miswired the circuit. Go back and check your circuit carefully. You also might need to play with the setting on the potentiometer to get the contrast set correctly. Now, watch the counter count up and down carefully. You should notice something peculiar as the counter counts backwards. What do you see that is not good? What you should see is that as you count down from 10 to 9, you end up with an extra ‘s’ on the word ‘Seconds’. You end up with ‘Secondss’. This is a vexing problem which occurs just about every time you try and use an LCD. The reason is that when you go from 10 to 9, printing the number goes from needing two digits to one digit. Then, when you print ‘Seconds’ it is shifted to the left by one character, and you are still left with the last ‘s’ from the previous time you printed ‘Seconds’. Hence you are left with a mess. There are two ways to clear this up. One way would be to specifically set the cursor to a correct position before printing ‘Seconds’. This would put it in the same place every time, and alleviate the problem. The other possibility is to print a blank line each time through the loop to clear the second line of the LCD. This is something you need to play around with and understand, because it seems to come up every time I try and use an LCD. Look at this code, and try it, and make sure you understand why it fixes the problem. OK, your assignment is to play around with the LCD and become comfortable with it. Show me that you can make it do some new and interesting things. Write a program of your choosing that uses the LCD as a display. You might consider making it the display for one of the projects you did in one of our earlier lessons. In Lesson 8 you learned to write analog voltages on the Arduiono, and in Lesson 10 you learned to read analog voltages from the arduino. In this lesson we will combine what you did in lessons 8, 9, and 10 to create an LED with adjustable brightness. The brightness will be set based on the position of the potentiometer. In order to do this, we need to set the potentiometer up as a voltage divider, and we need to drive the LED from one of the analog pins. For this example, I am using pin 9. The circuit schematic I am using is shown below. In placing the LED into the circuit, remember that you must always put the longer leg towards the positive voltage. In the case above, the longer leg should be connected to the resistor, and the shorter leg connected to ground. Also remember that we are using a 330 ohm resistor in the circuit to limit the current through the LED. 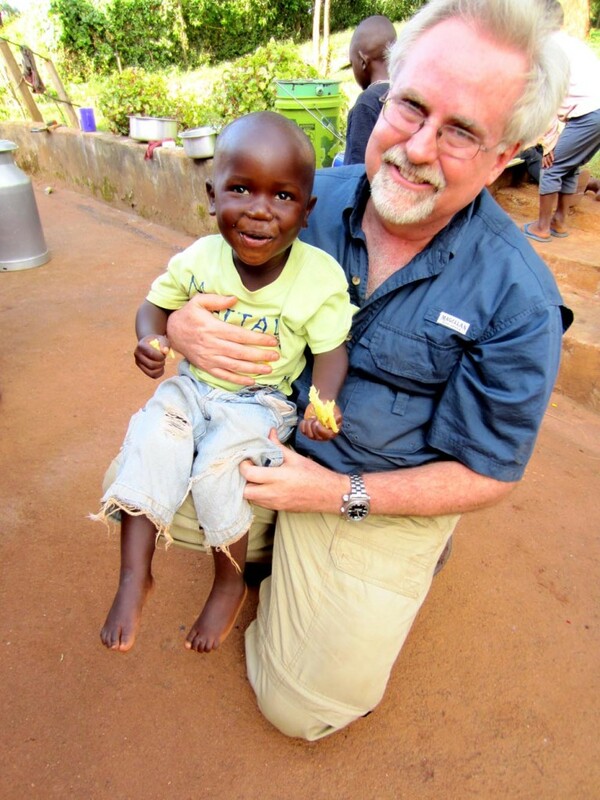 The goal now is to use what you learned in the last three lessons. You will want to read a value from the potentiometer, and then write a voltage to the LED based on the reading from the potentiometer. Remember that when you read an analog voltage between 0 and 5 volts, the arduino will report a number between 0 and 1023, with 0 representing 0 volts, and 1023 representing 5 volts. 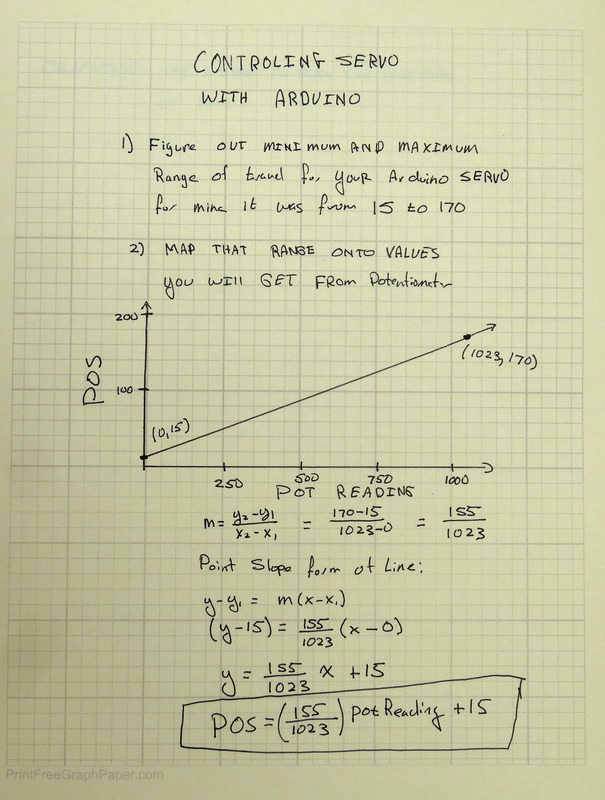 Similarly, when you are writing an analog voltage between 0 and 5 volts, you must write a number between 0 and 255. If you write a “0” value, that corresponds to 0 volts. If you write a value of 255, that will output 5 volts. So, you must scale your write values between 0 and 255 to get voltages between 0 and 5 volts. The tricky thing now is that we want to dim the LED based on what value we read from the potentiometer. If we read a 0 value from the potentiometer, we want to write a value of 0, which corresponds to a voltage of 0. If we read a value of 1023 from the potentiometer, then we will want to write our maximum voltage of 5 volts, which means we need to write a value of 255. 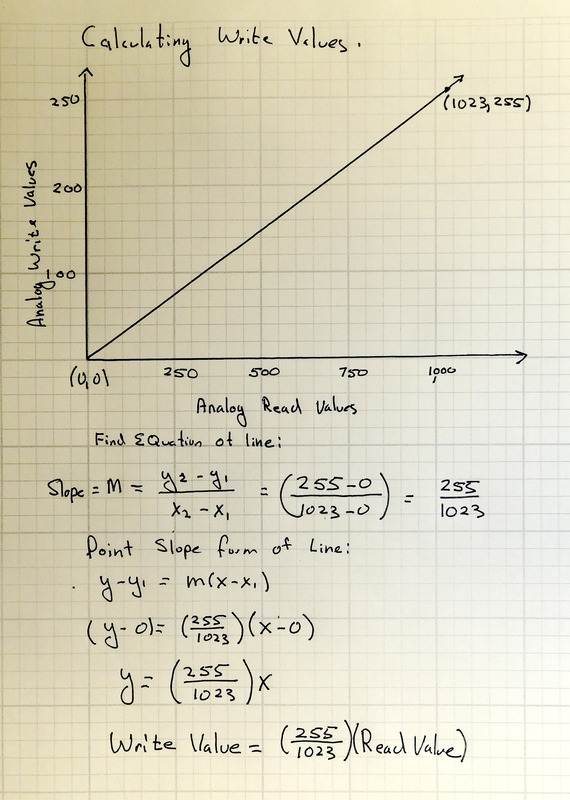 Basically, we need to scale our read values, which will be between 0 and 1023 to suitable write values, which should be between 0 and 255. We must scale our read values (0 to 1023) to suitable write values (0 to 255). So, from the math above, we can see that the Write Value that we should write to the LED should be the value that we are reading from the potentiometer X (255/1023). With the math out of the way we can write the program. This code is designed for the schematic above where the potentiometer center leg is read with pin A0 and the LED is written from pin 9. With this code, you should be able to set the brightness from the potentiometer. You read the voltage from the potentiometer and then scale the value you write to the LED based on the reading from the potentiometer. Sparkfun Inventor’s Kit : While the bare arduino will get you started, I really suggest getting the Sparkfun Inventor Kit. The projects I will feature in this tutorial set will use the components in this kit, and it is probably cheaper to go ahead and get the kit than to buy the individual components as you go along. The kit is under $100 on Amazon. 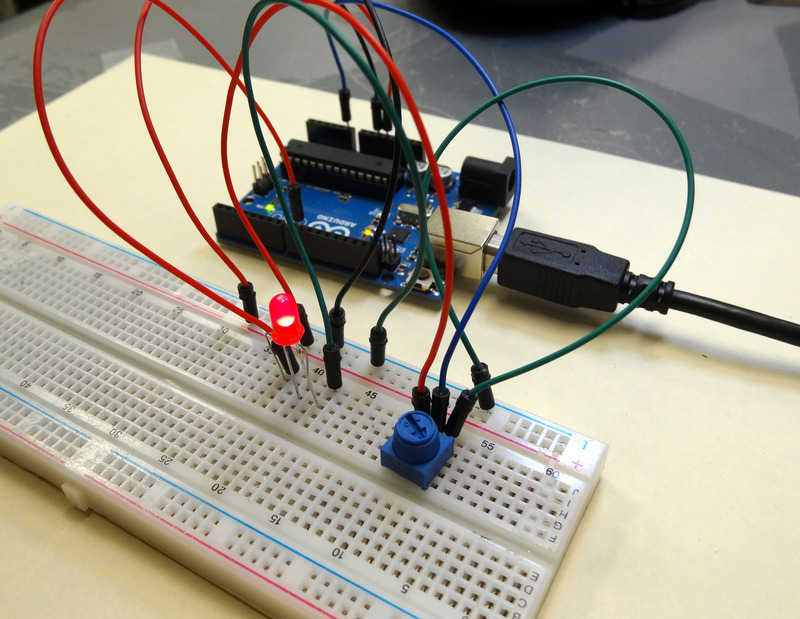 The sparkfun kits has everything you need including the arduino.